The day of the 18th December started like the previous 2 to 4 days - hot and sticky. The temperature reached about 36 degrees by mid afternoon. At about 4.30pm I noticed a thunderstorm southwest of Ballina. As it got to the coast the anvil became more defined and sharp. I noticed a short time later (5pm) it had an overshooting top behind the anvil. I speculated that it could be a supercell but from the photos I've seen of them I thought it was or building up into one. I went back inside as the storms lately have an annoying habit of dissolving as they come near the coast. It was about 5.30pm when I noticed cloud coming up from the south. I watched it through the window for about 10 to 15 minutes then went outside to the service station next door. 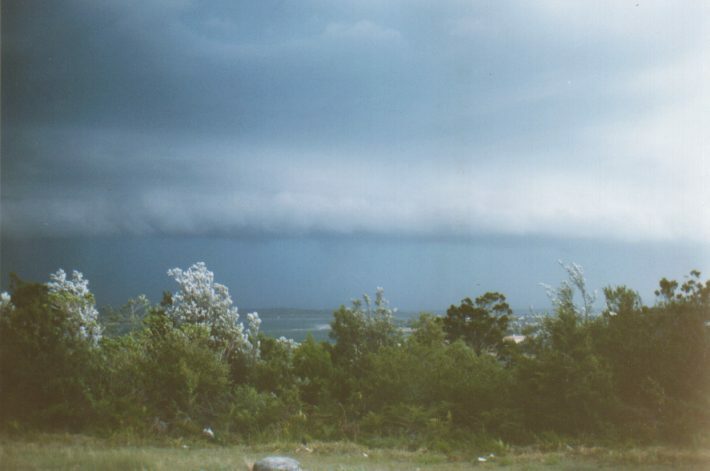 By then a roll cloud had appeared at the front of the storm. I was talking to a worker at the station about whether or not this storm was severe. He told me it wasn't, but judging by the colour (dark grey with deep green/blue tinge) I thought it was. The time now would have been about 5.55pm and I was deciding whether or not to go over to East Ballina for a look. I decided to bite the bullet and grabbed my camera and took off for East Ballina. As I was going up Hill street, a massive flash of lightning lit the sky up. 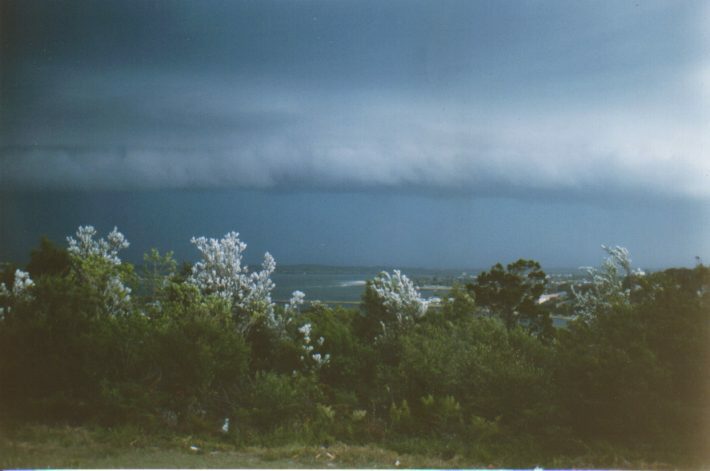 As I was up at the lookout at East Ballina the roll cloud was coming towards me at a fast rate. 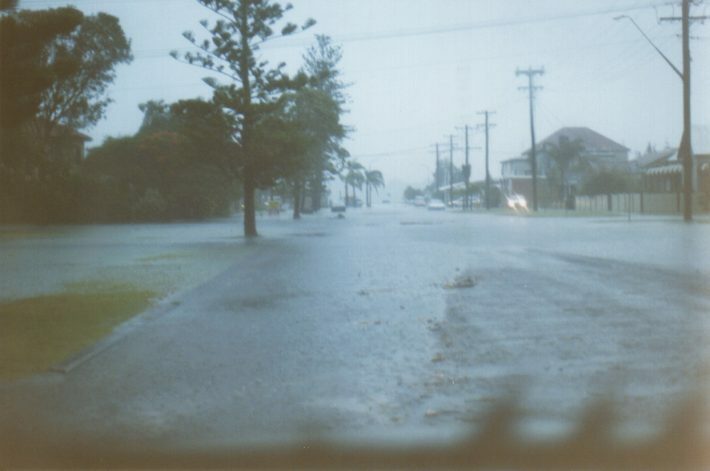 It started out at sea and ended at Alstonville or a little bit more inland. The lookout has a 270 degree view from NE to NW. Looking S and SW from the lookout at East Ballina. The lightning that came out of the storm was incredible, one CG after another, just constant flashing. The funny thing, there was no flickering lightning up high that I could see. The lightning was getting too close for comfort, so I hightailed it back home. In the 5 minutes it took the storm had hit Ballina. The winds that were blowing just before the storm hit were northerlies at about 25-30km/h. The storm hit at 6.10pm with rain, very close CG's and wind from the south. The rain increased in intensity and the golf ball sized hail started falling at about 6.20pm. The ground was so hot and there was so much rain falling, that the hail just melted as soon as it hit the ground. Water started to come in from the service station and started to flood my backyard. At about 6.40pm the wind picked up from the SE and gained in strength. Unfortunately my weather station copped a blackout and the strongest wind gusts were not recorded. Also my raingauge moved so I couldn't get an accurate rain reading. The wind changed to the east, then to the northeast as the storm moved north. After the storm finished, I went out to get some photos. 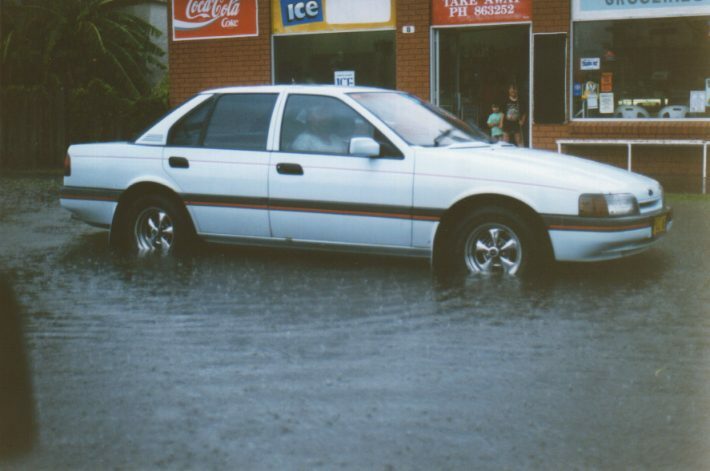 Norton street between Tamar and River street was flooded to about 12-15 inches. Trees were blown down over at East Ballina, places lost their roofs and a large tree fell on a parked car. West Ballina copped the brunt of the storm with Kevin Geaghan Funerals losing part of their roof, the Chapperal Motel losing part of the roof off the carpark, a number of vans across the road at the Hibiscus Caravan Park were damaged. There were reports of a funnel cloud but they are still unconfirmed. The damage at West Ballina looks like a downburst or possibly a small funnel. The SES has 77 calls, 20 being for lost roofs. Cricket ball sized hail fell at West Ballina and central Ballina. 2pm and 5pm local 18th December 1998 - click on images for larger view. 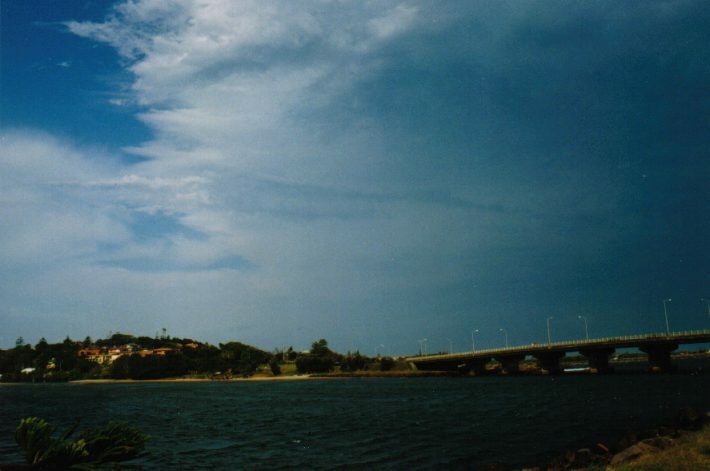 On the 18th of December 1998 a severe thunderstorm carved a path between Yamba and Murwillumbah on the far north coast of NSW. This storm had wind gusts at around 200km an hour causing falling trees and houses to be uproofed. Hail was reported to be the size of billiard balls. This storm has been the biggest event I've seen this year so far. Fortunately where I live we didn't get the full impact of the storm. On travelling home from work I saw a cell to the distant south. A cell in that direction generally passes to the east and we see nothing of it. However this one was heading our way. It seemed to be heading north northeast. This thing was moving quicker than usual and it was obvious by around 5pm that it was on the approach. 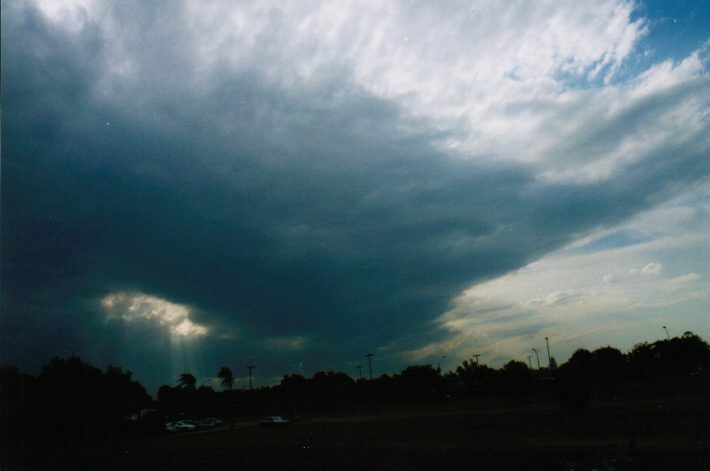 The cloud itself had a defined outline. Around 5:30 strata cumulous rolled in from the south. By this time the supercell was overhead. 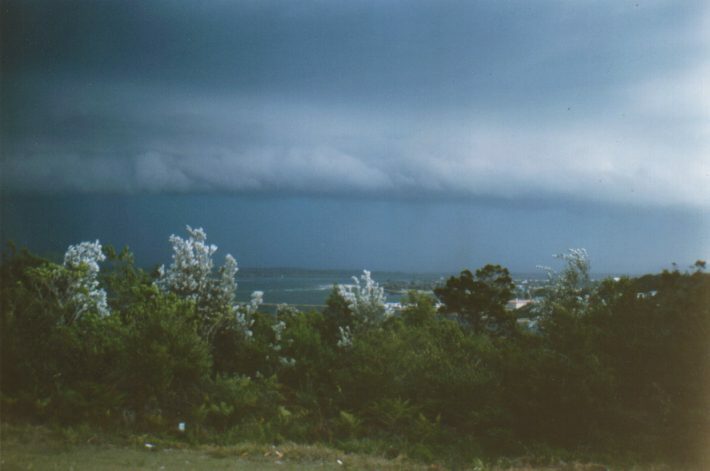 Then came the shelf cloud. This seemed to be coming from the south east and rapidly. I had an opportunity to go outside just before the storm hit and underneath the dark blue shelf cloud the sky took on a green appearance. There was another cell to the south west which makes me think we experienced that storm as well. The gust front hit and surprising there wasn't any hail in our area. The wind was bending bushes and trees and at the height of the storm lightning was close with loud claps of thunder. The main feature of the storm was the strong wind gusts which may at times have reached around 100km hour. Rain was heavy and we received 43mm within the hour. The storm hit around 6pm and lasted 40 minutes. During the storm like many others we lost power believed to be caused by a lightning strike on a transformer. Tree branches fell across the road. After the storm had passed the sky to the north and northwest took on a deep blue appearance. By dusk several cells of lightning were seen in this one supercell from the east through to the northwest. The rest of the evening was uneventful. This was one of the most spectacular storms I have seen for some time. It was interesting how the main body of the storm seem to come in off the coast. News reports of damage to homes even aircraft overturned in their hanger was caused by the storm. I was only glad we didn't have a repeat the next night. 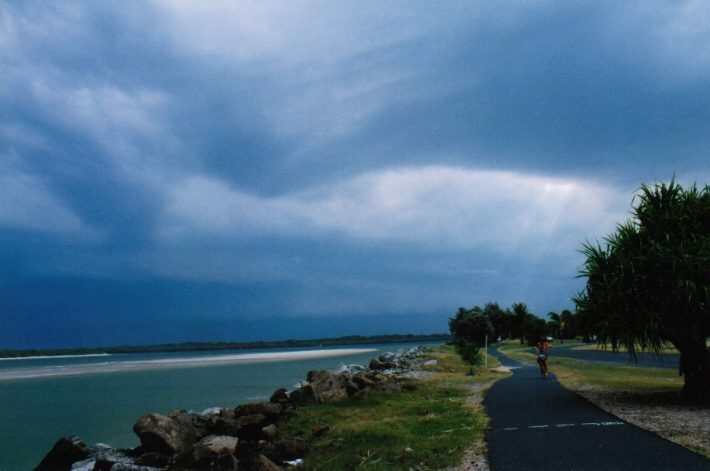 I get onto Palmers Island, and the storm intensified further. I was punching the core of this beauty! (NOw Kids dont do this at home................). The water from the sides of the road (its the estuary of the river or lake or sumthin) looked like a force 11 gale!! The spray was actually being whipped over the road, as bits of weed and stuff were blown over the car!! Ligthining (CG) was smashing down around me, and I feared for my life. I decided to keep going. It clamed a little as I headed towards Yamba,but then I looked to my SE and saw a green / balck "Barrel" of storm heading towards me. I rang Ken at the Sydney BOM severe weather section advising him of the damgerous situation, and that there was no radio warnings at all. The people of Yamba were about to be caught totally unawares. The "barrell" of cloud swirled around as winds reached maximum intensity of about 165km/h (the BOM said that 66knots were recorded at Evans Head which is about 30 km/h North and only received the side of the storm). I was core punching this again, and I didnt realy like it. Extreme Torential rain smashed against my windows, with the window wipers of high, I couldnt see 5 m. Great branches were flying across the road, palm trees were bent below horizontal, and severe flash flooding had reduced streets to creeks & streams. Then I heard it. The clunk, clunk clunk of hail. I speed up, hoping to make it to saftey. I was talking to Ken at the severe weather Section when bang, a golf ball size hail smashed into my window, cuasing it to crack immediately. More started to fall, bouncing of the tar like rubber balls. The only saving feature was that there was not a great lot. I made it to my motel, and got out and ran upstairs to grab the camera. Then the line hit again, and the wind howled and moaned. Trees snapped mid trunk, water was whipped to a frenzy.Power went out. The wind moaned like a dying man, then screamed as it intensified. I belive that it muts have gone close to 170 km/h in a short burst, as when we were in Darwin, it sounded nothing like this. Water was everywhere. Then as quick as it had come it was gone. 25 mins after the most intense storm I have ever experienced. I then went for a drive and got some pics of the devastation. Trees down everywhere. NO power. Some roofs off. All the suger cane crops flattened like someone had walked on them. The looking to the west a 2nd squall line was coming! I quickly put some more film in, and waited. It only produced moderate rain and spectacular cg lightning. I believe this baby developed between the 3pm satpic & 4.30pm with explosive development. The atmos was perfect. 80 knot jetstream, high humidity, high temps & plenty of instability!! The reason I believe it was a supercell was that it moved in a SW - E - SE arc, when the next one moved in a W - SE direction.